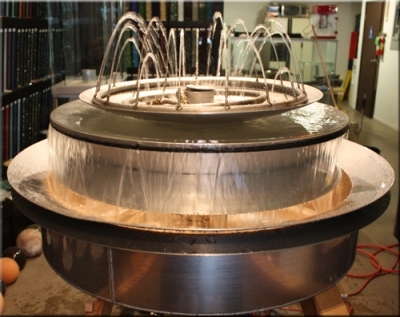 The 2nd issue, was the ring could of been bigger as we installed a triple 30" stainless steel rind. 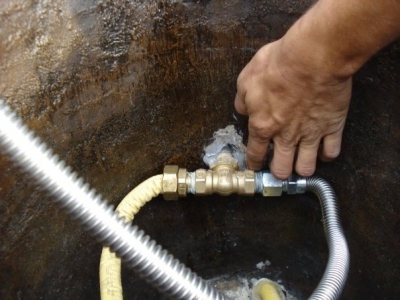 The third issue was the plumber installed a 3/8" reducer, why? 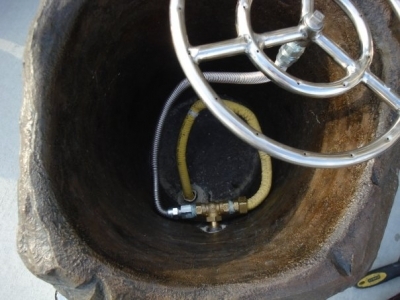 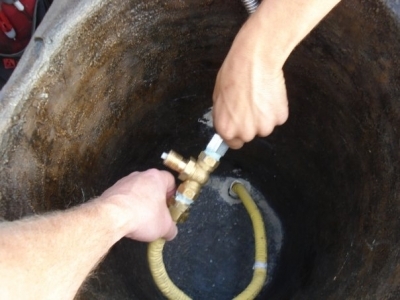 :-~ The gas comes is with 1/2", the ring is 1/2" so the plumber installed a 3/8" reducer in between the gas supply and the ring. 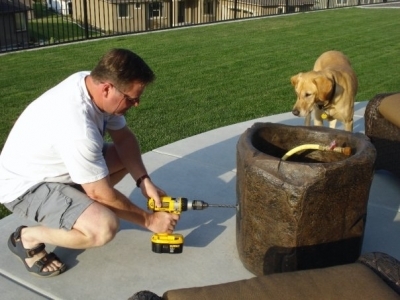 Why in the heck would he do this? 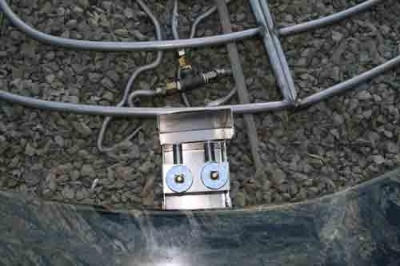 Anyway we just installed a 1/2" flex line and the pressure was back and fine. 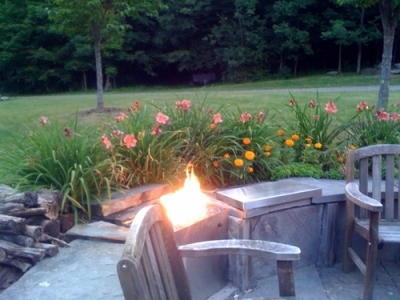 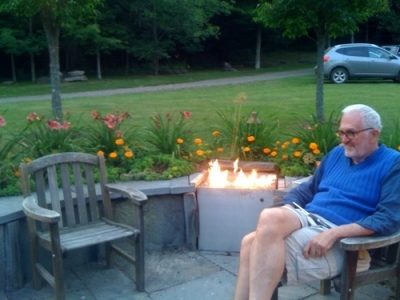 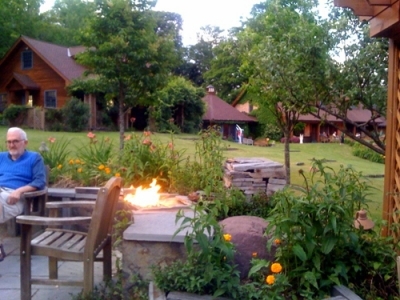 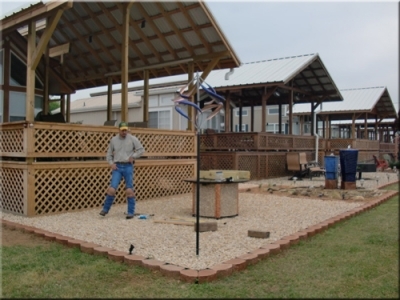 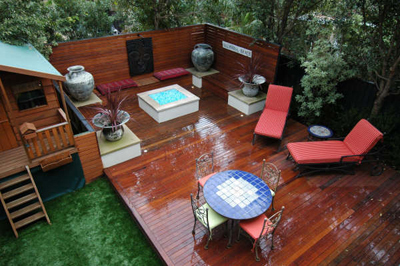 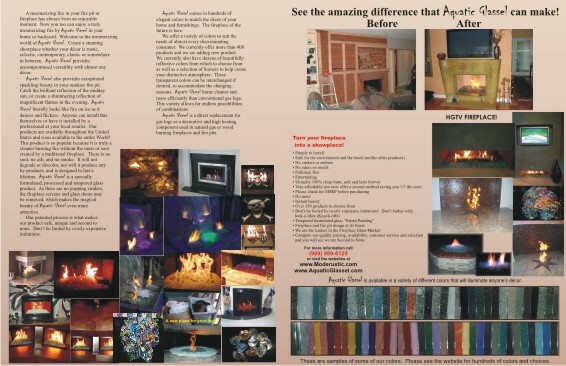 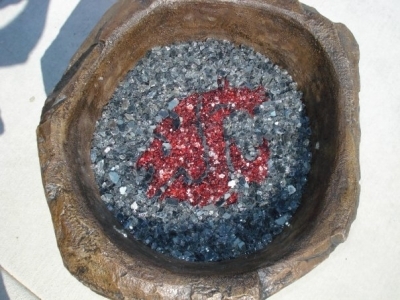 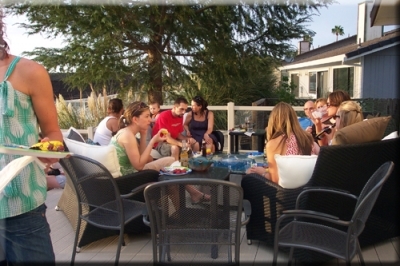 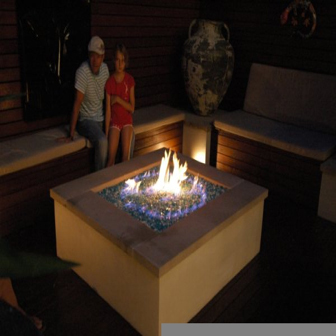 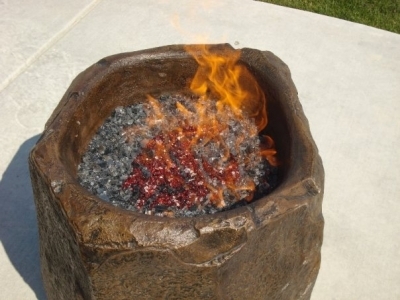 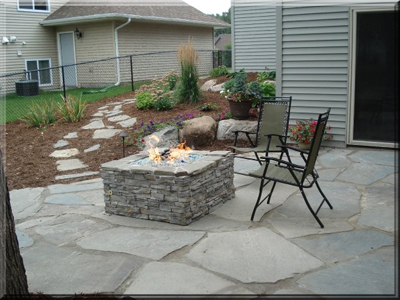 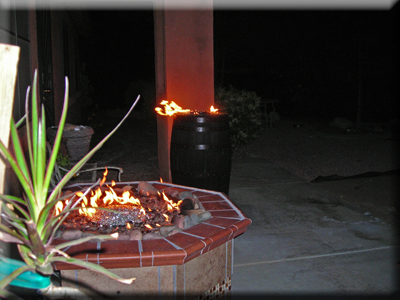 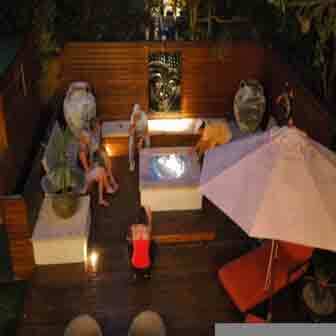 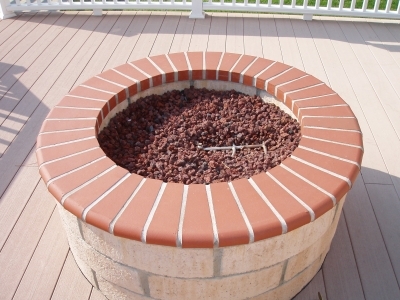 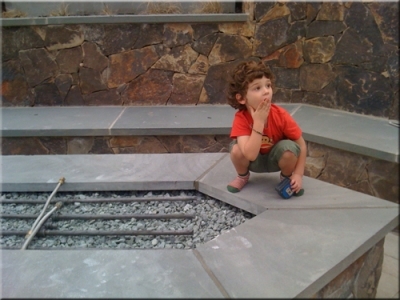 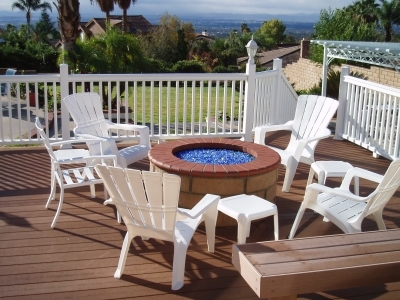 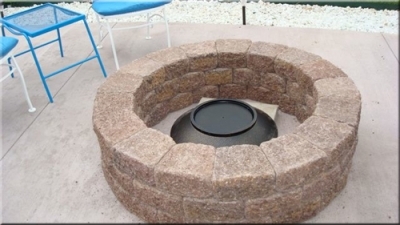 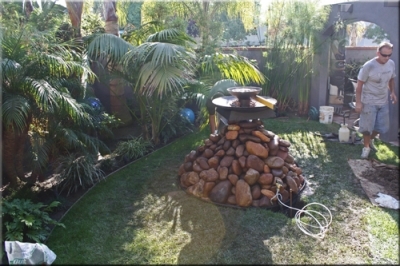 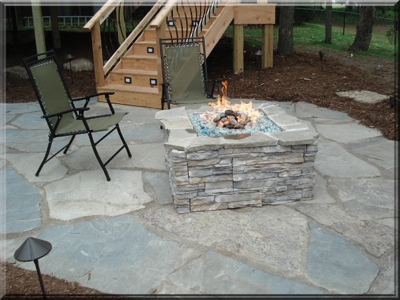 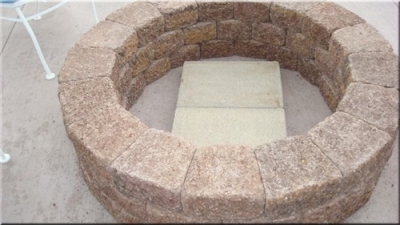 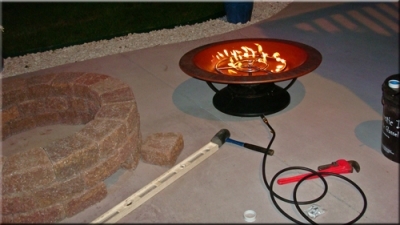 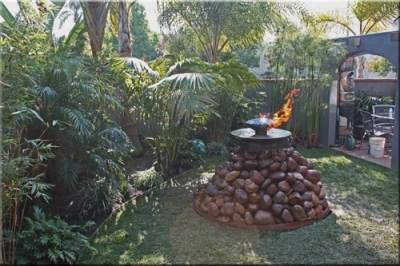 The fire pit pictures below were taken by and for the Sweat Equity weekly HGTV Do It Yourself TV Show. 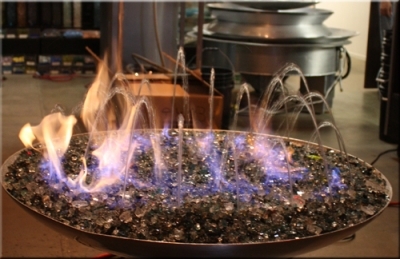 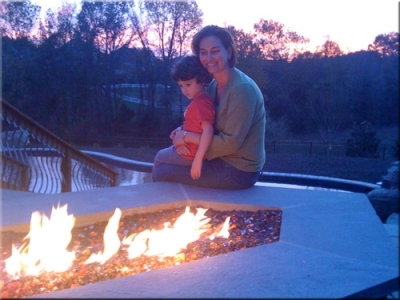 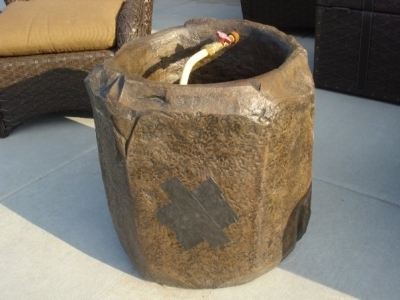 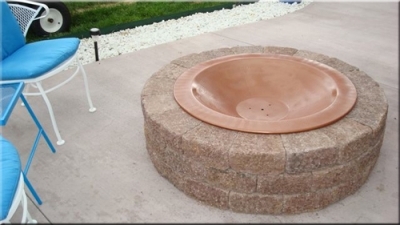 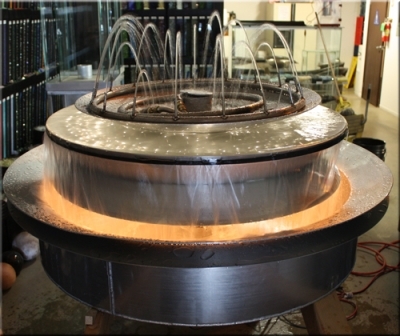 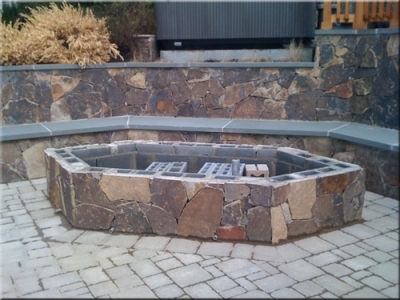 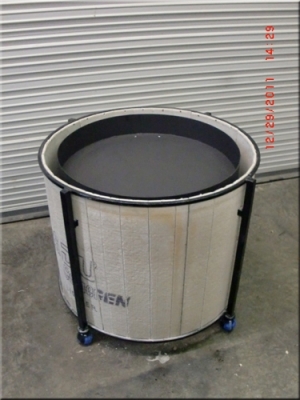 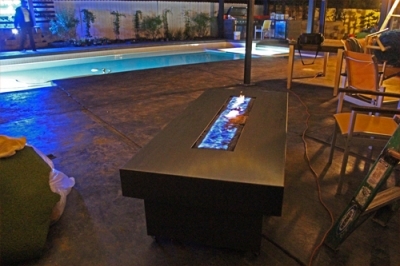 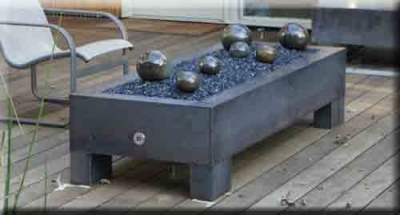 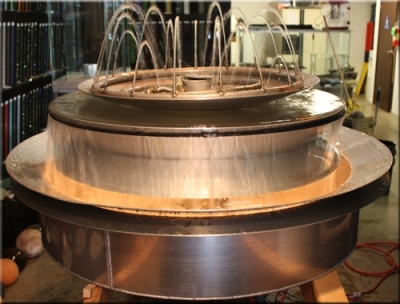 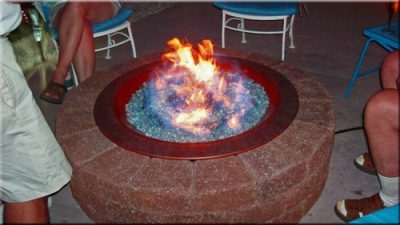 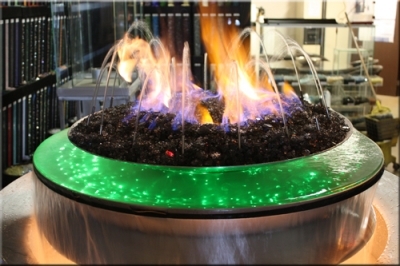 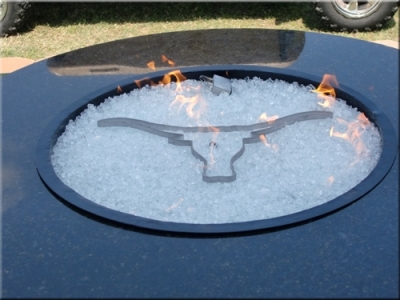 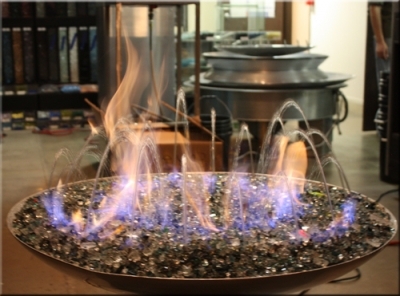 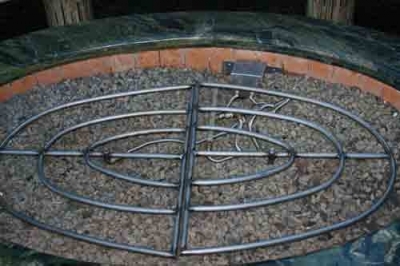 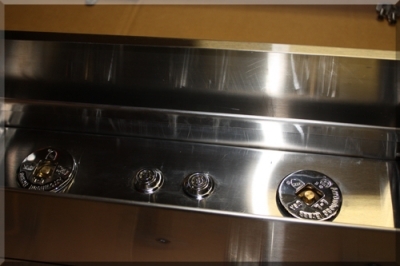 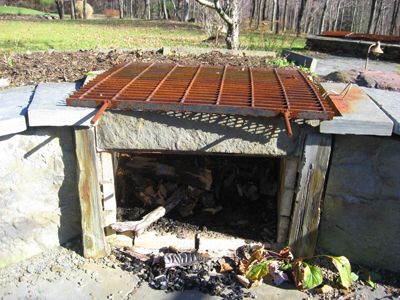 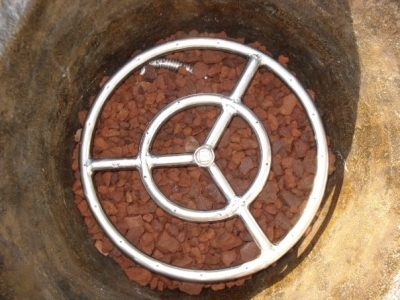 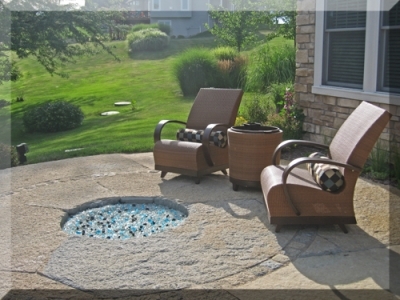 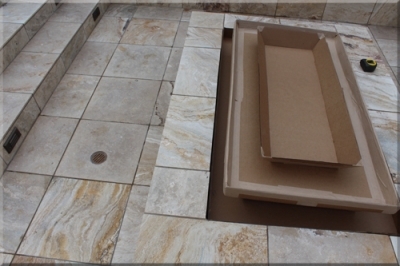 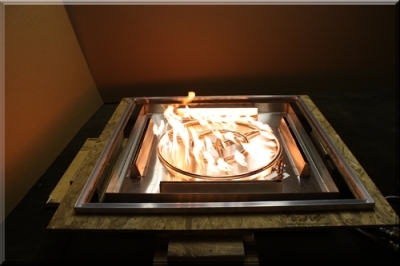 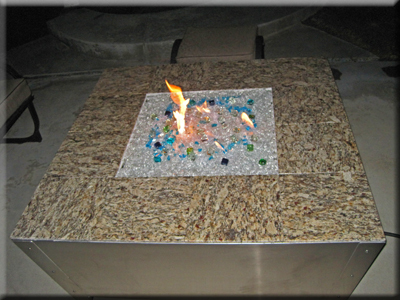 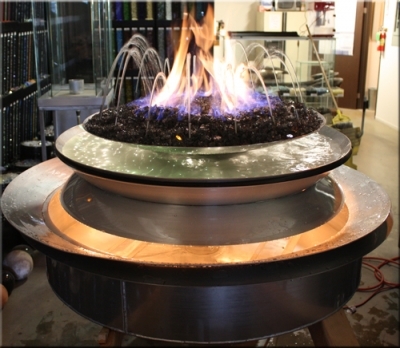 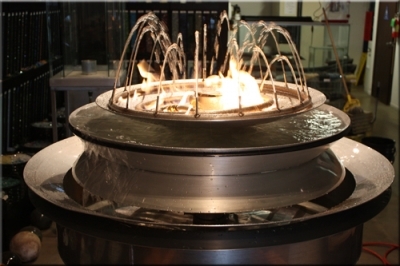 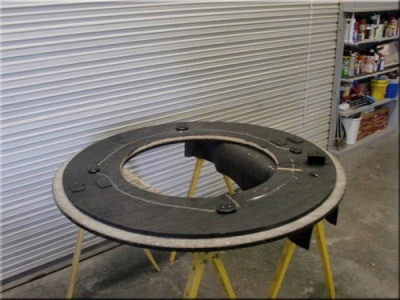 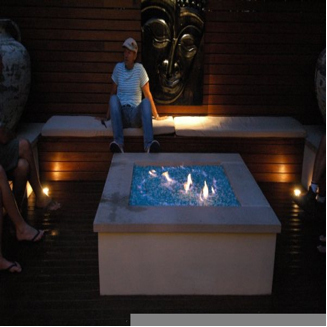 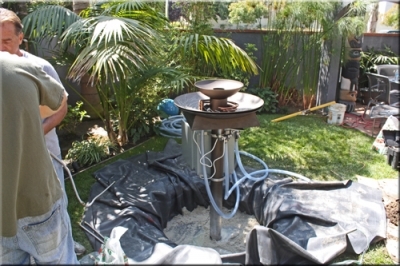 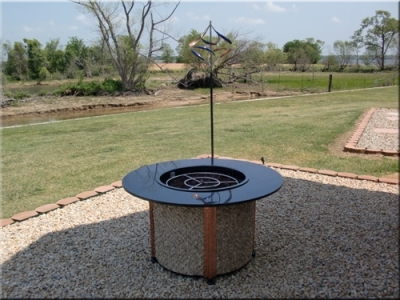 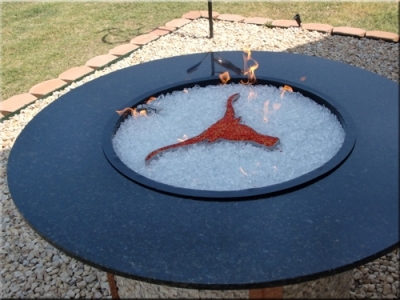 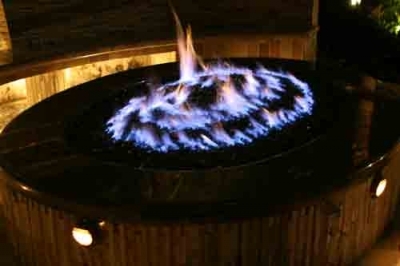 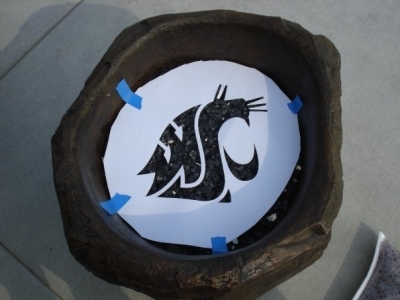 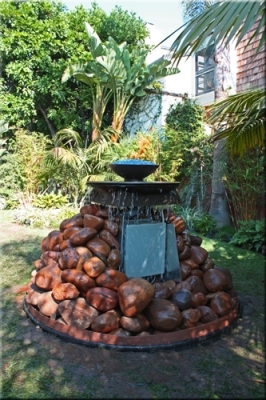 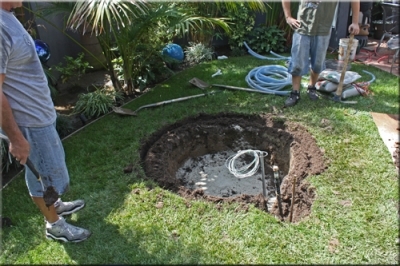 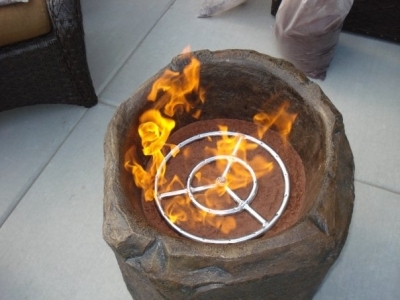 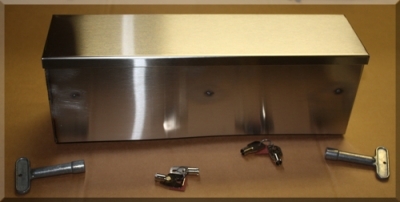 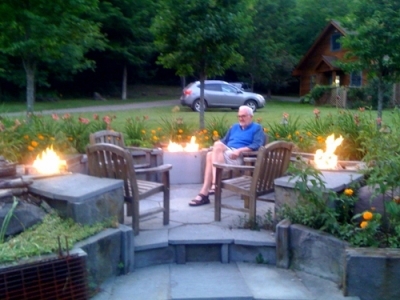 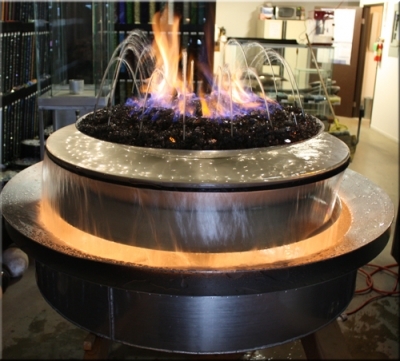 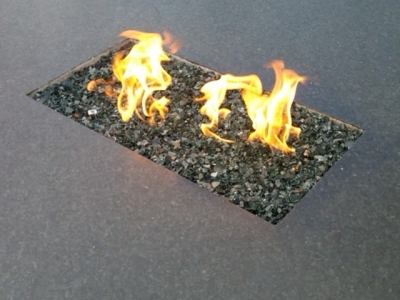 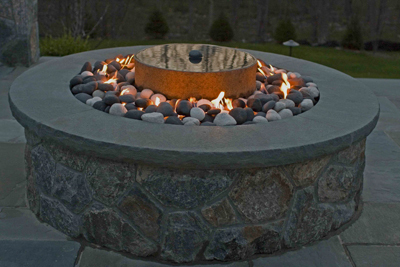 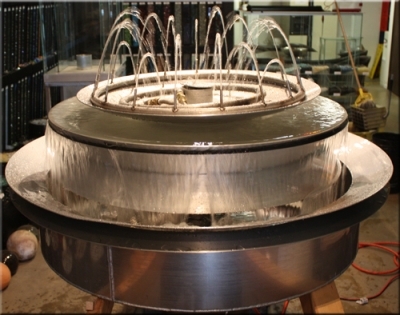 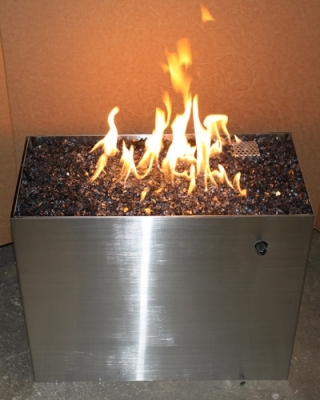 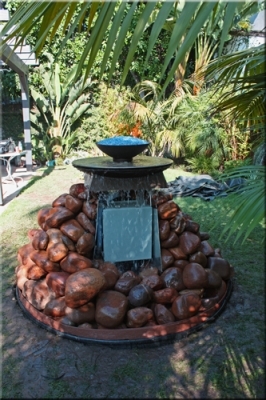 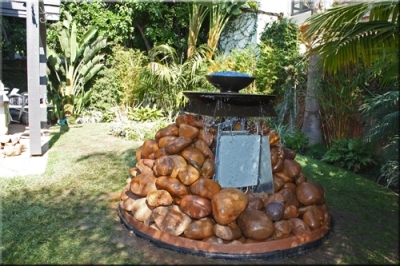 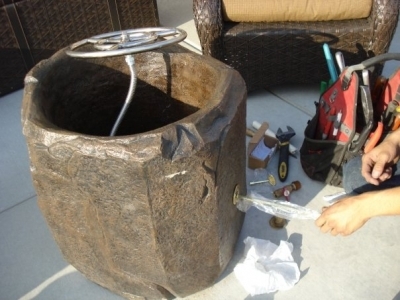 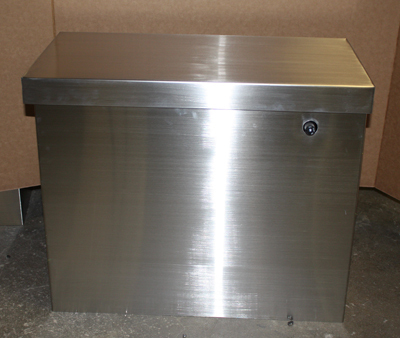 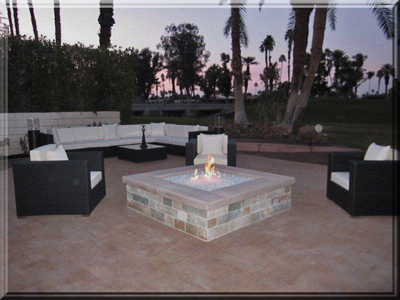 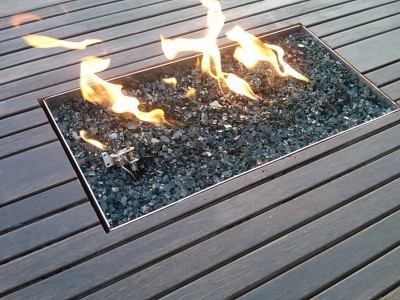 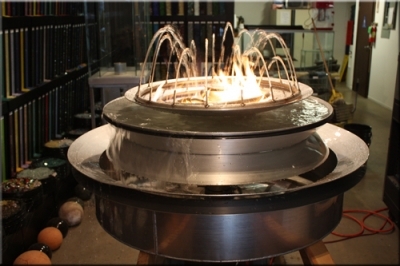 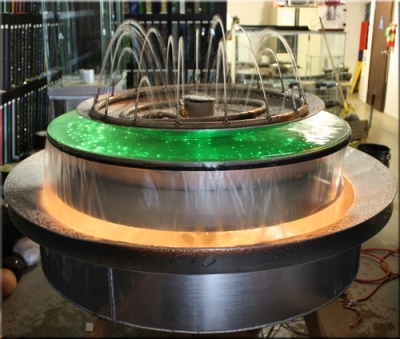 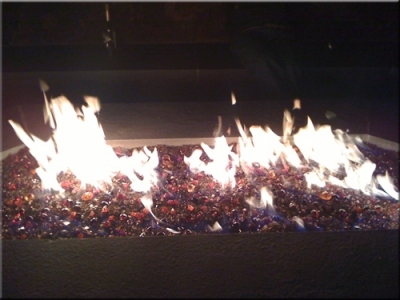 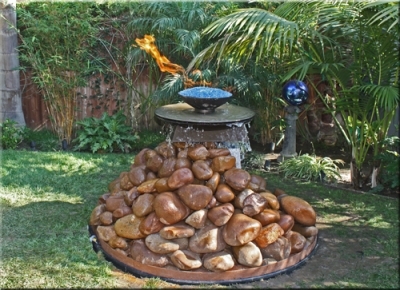 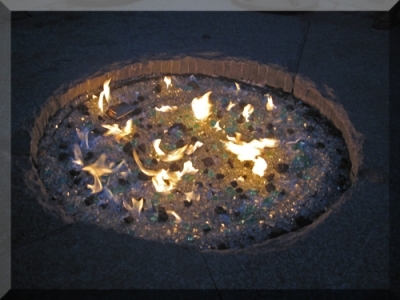 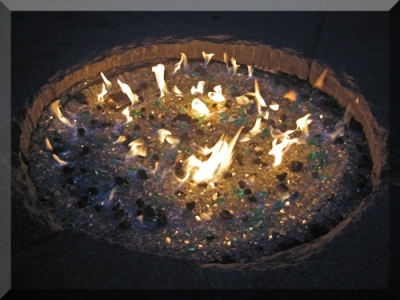 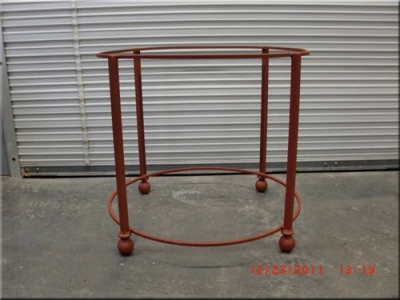 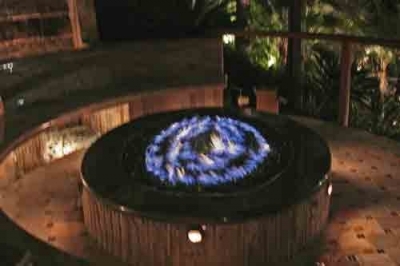 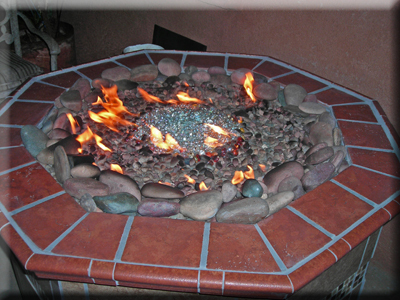 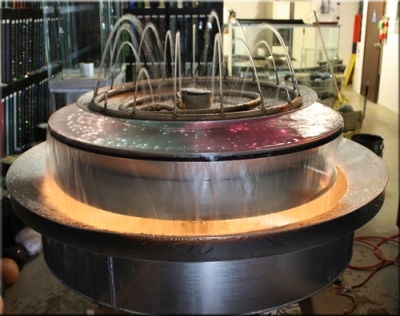 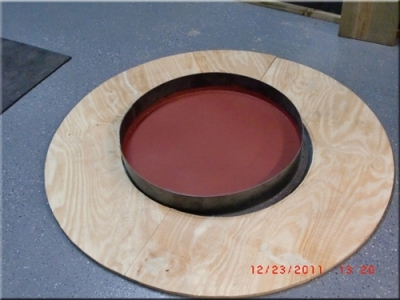 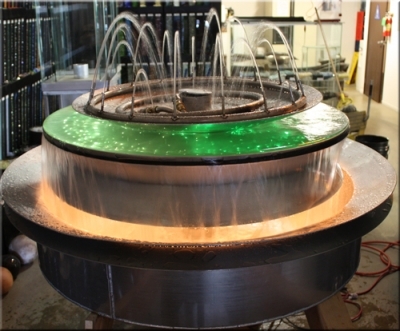 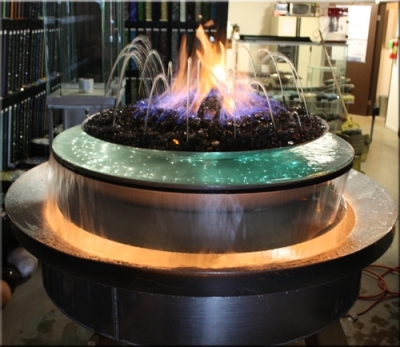 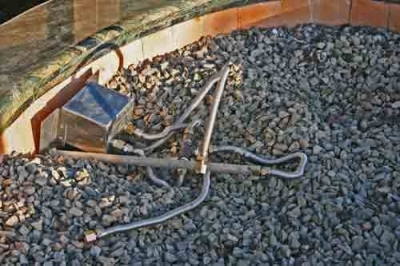 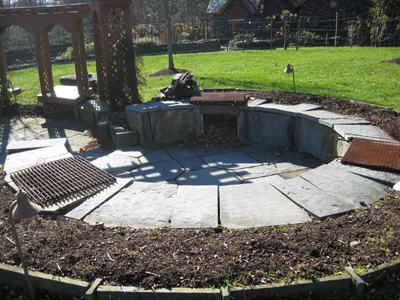 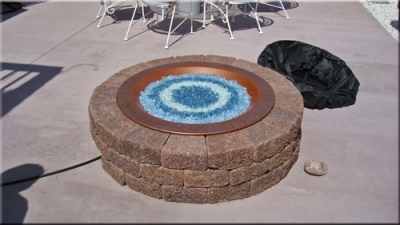 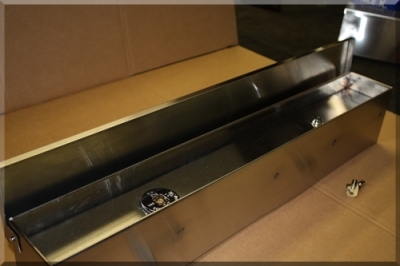 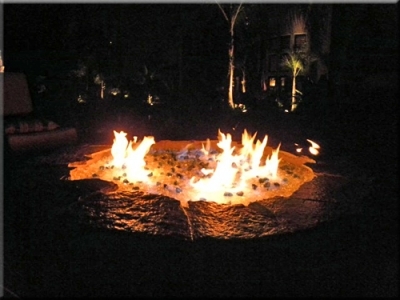 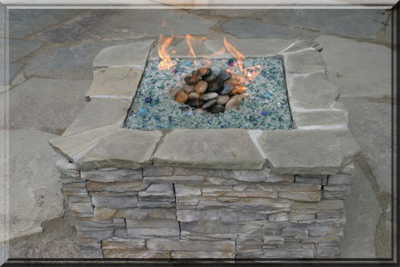 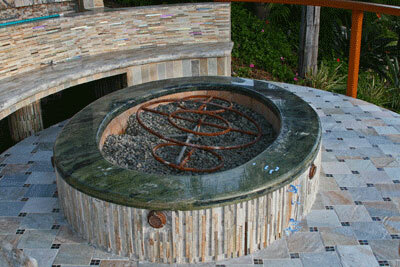 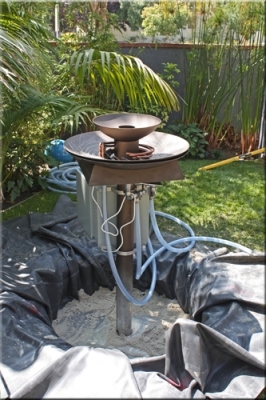 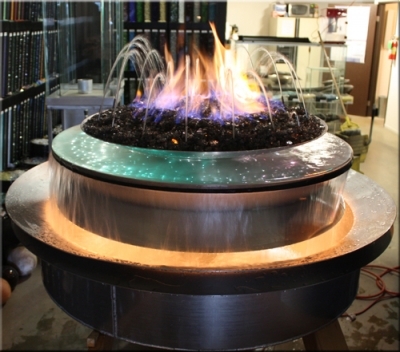 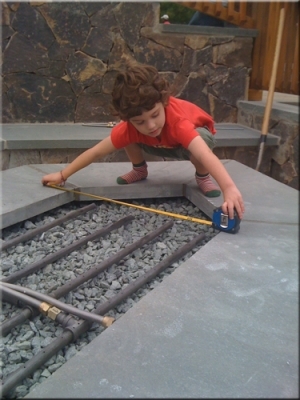 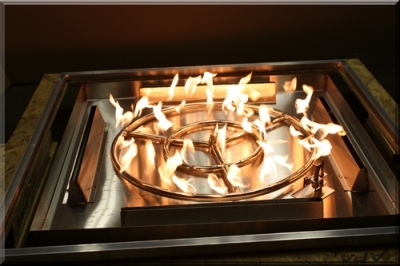 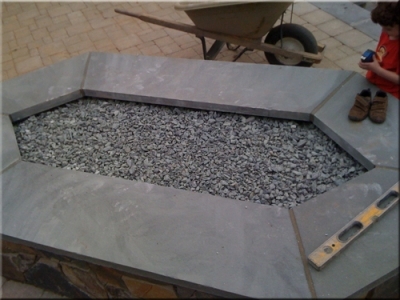 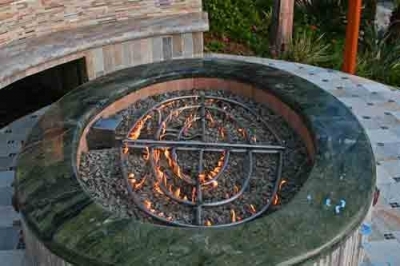 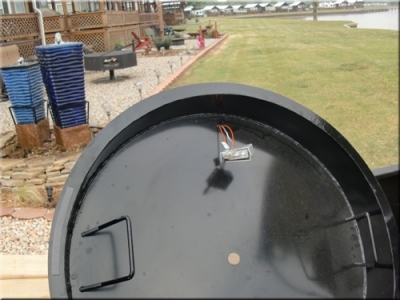 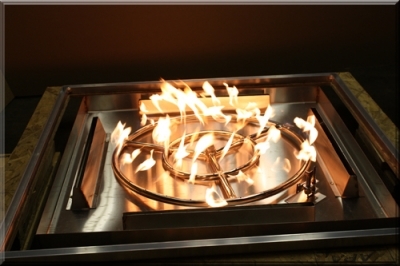 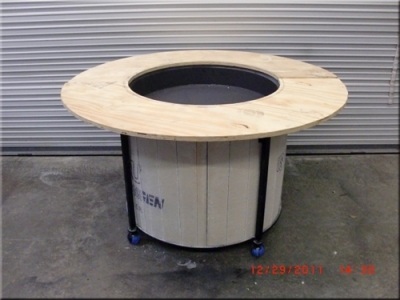 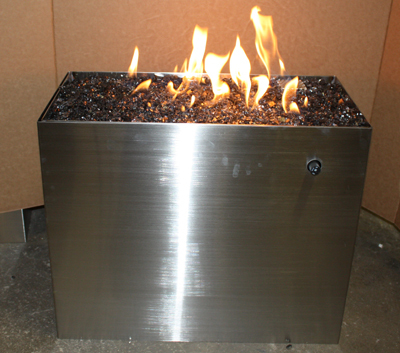 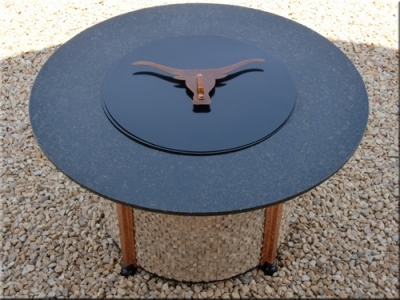 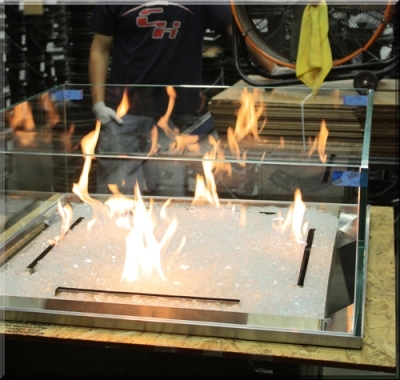 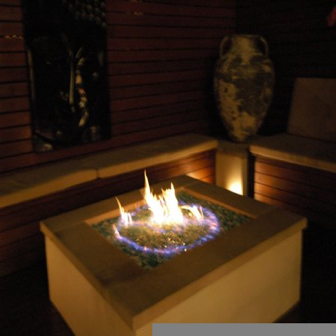 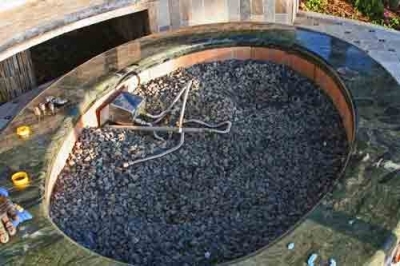 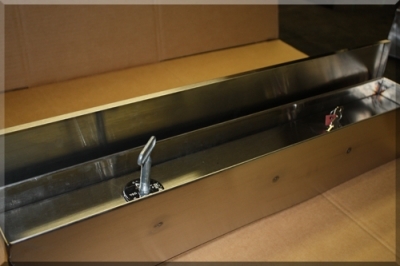 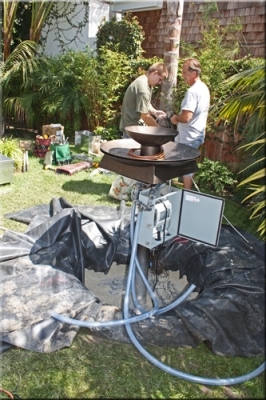 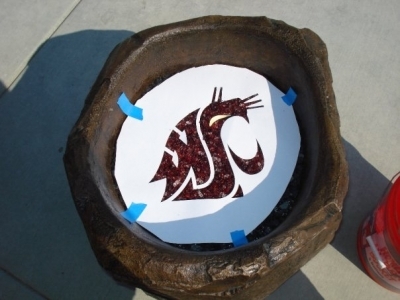 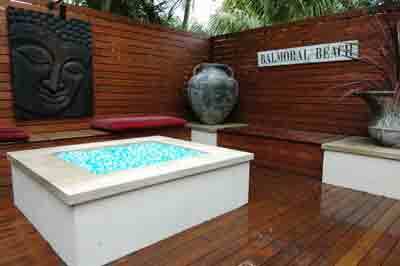 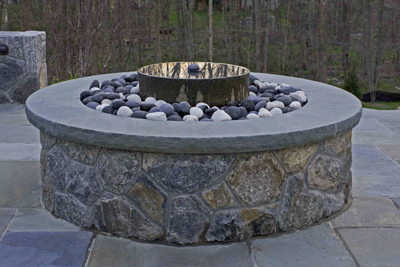 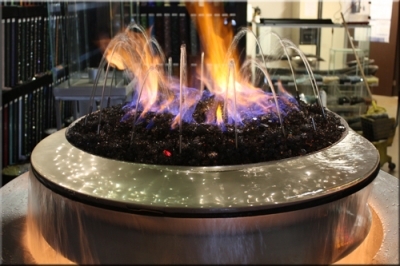 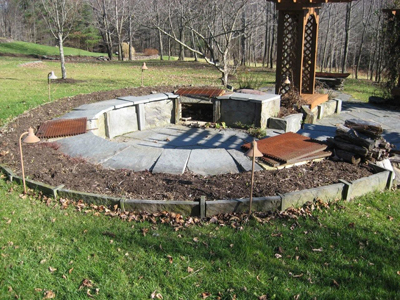 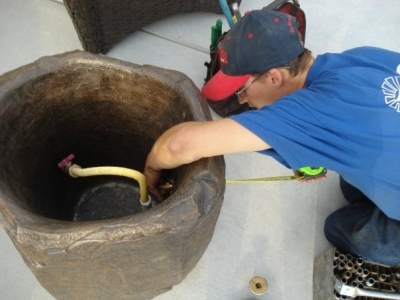 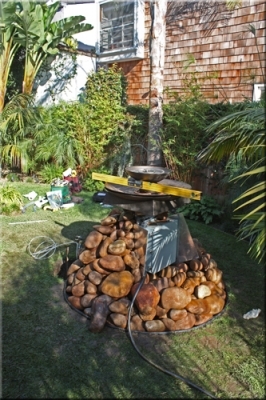 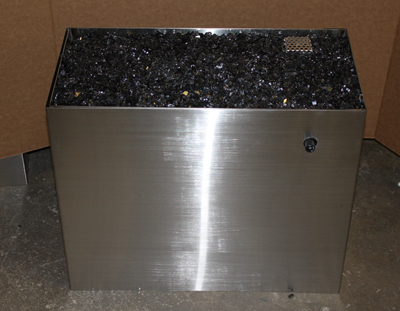 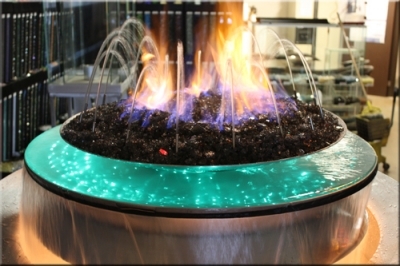 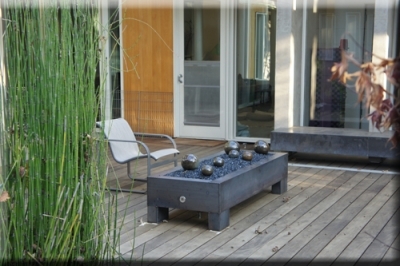 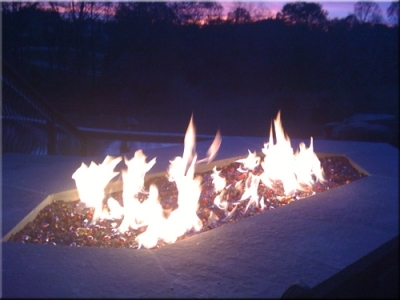 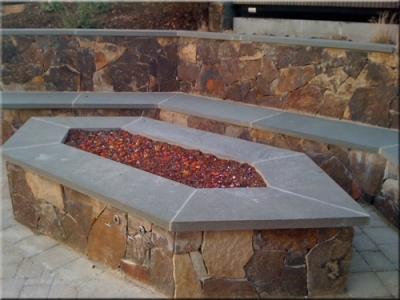 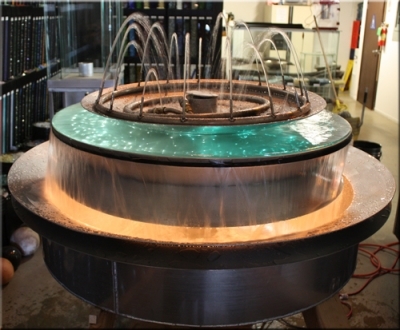 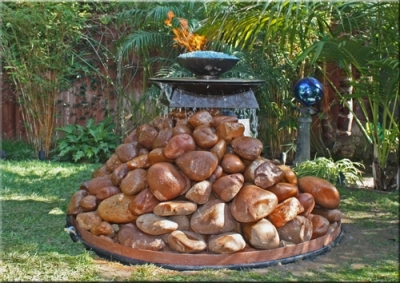 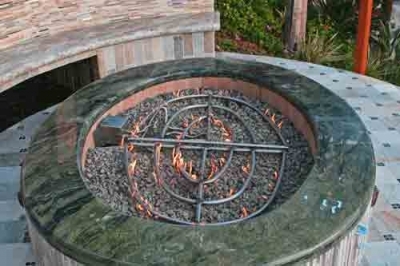 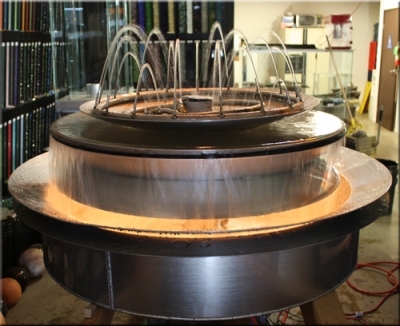 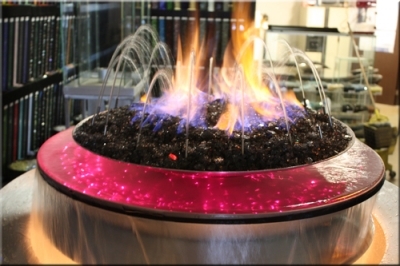 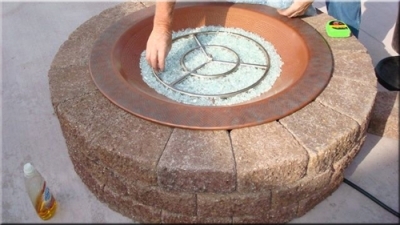 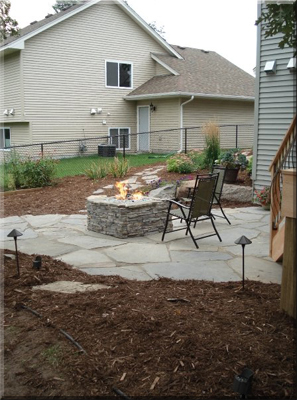 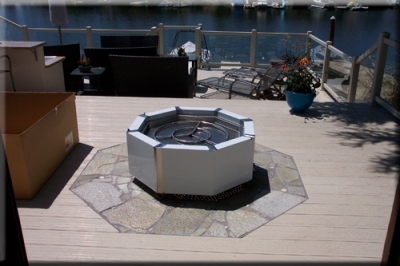 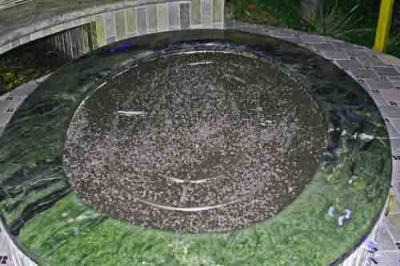 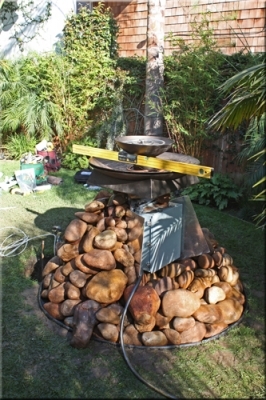 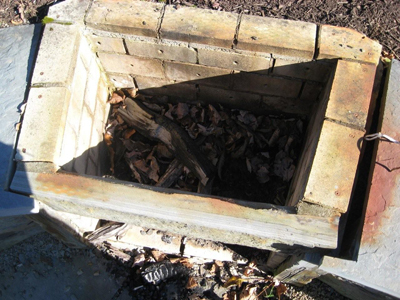 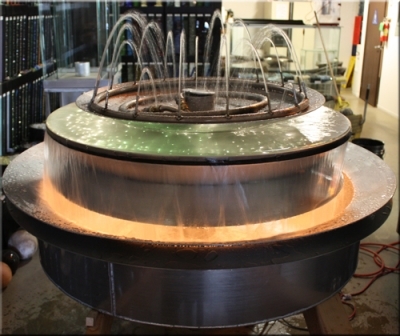 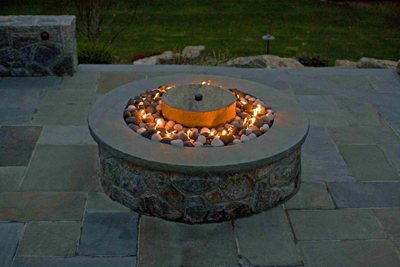 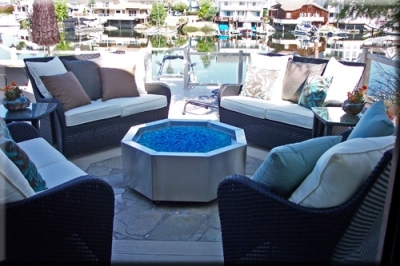 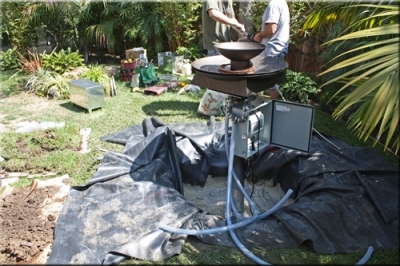 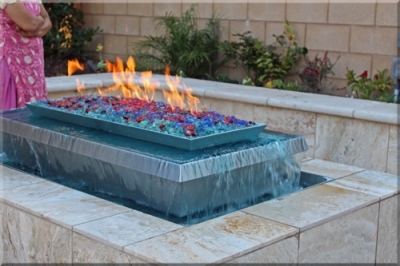 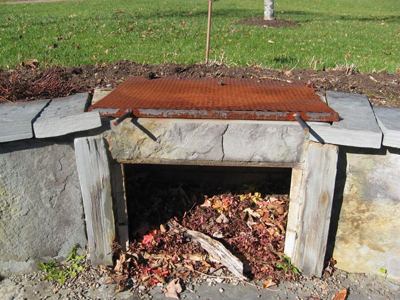 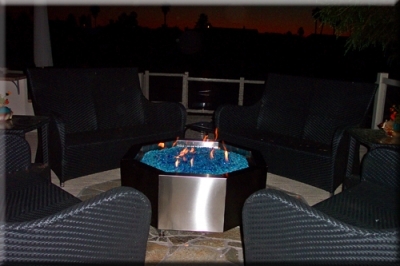 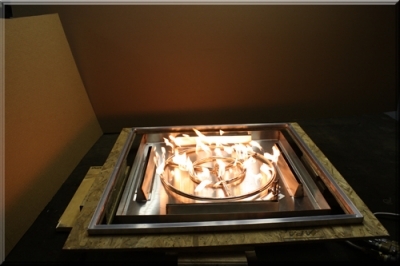 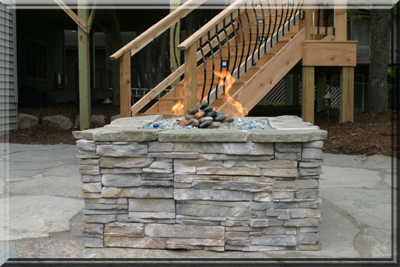 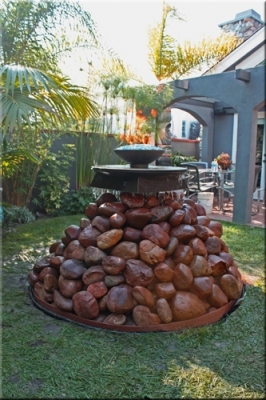 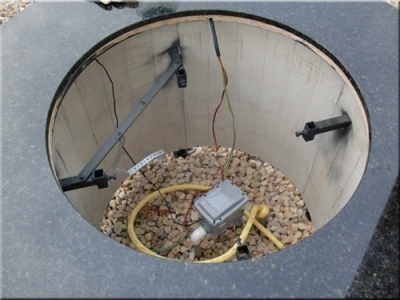 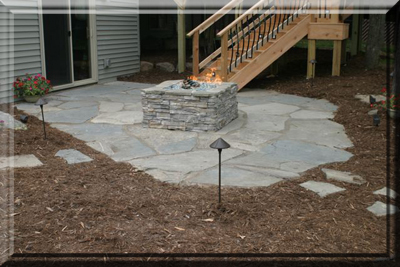 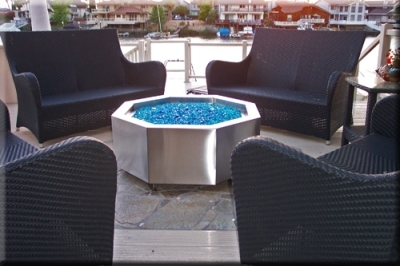 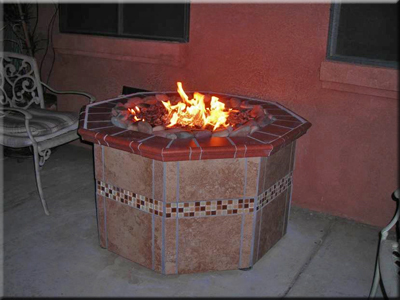 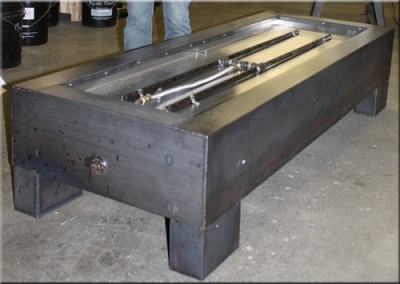 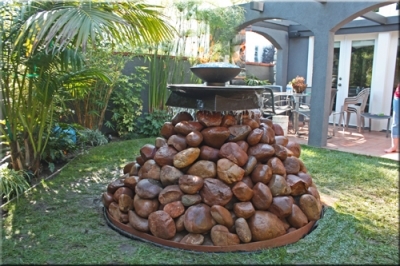 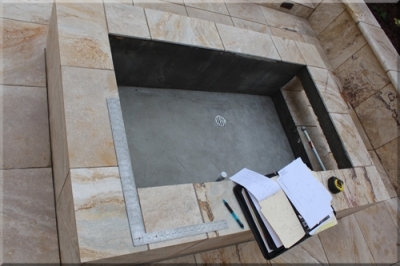 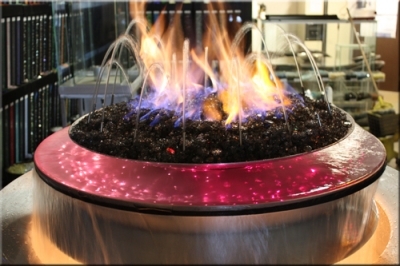 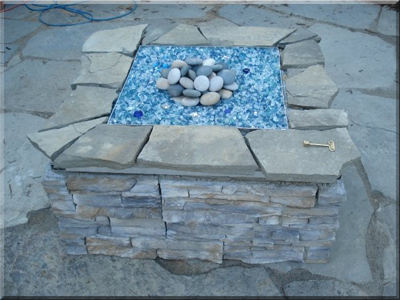 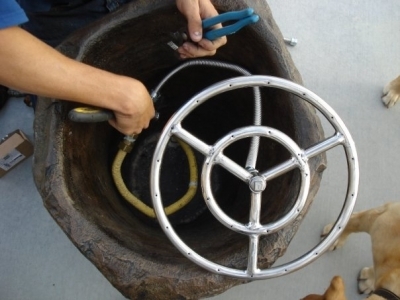 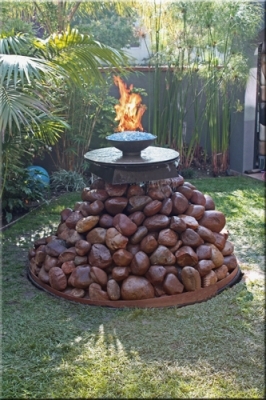 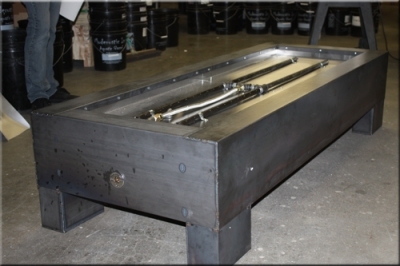 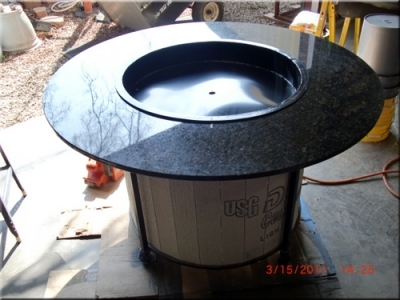 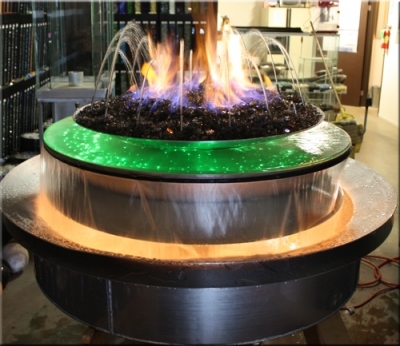 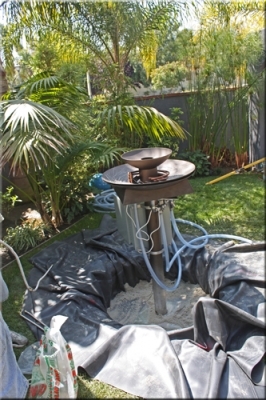 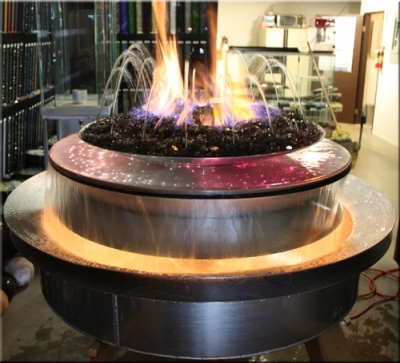 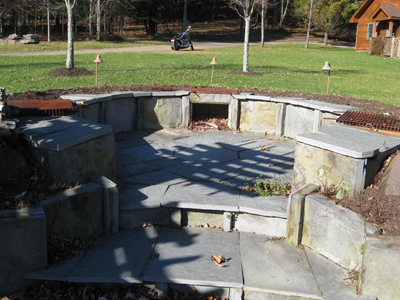 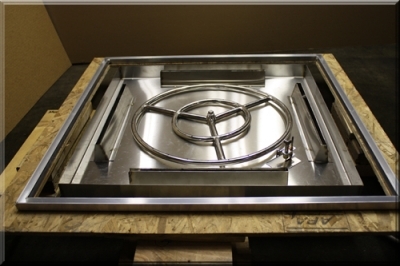 We used a 18" stainless steel fire pit ring burner with out the center to accommodate the water feature. 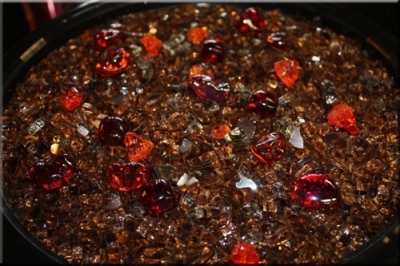 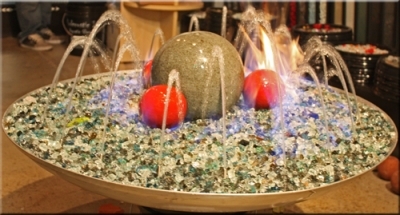 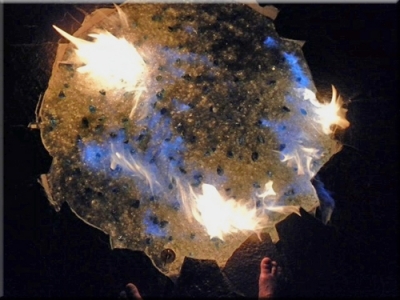 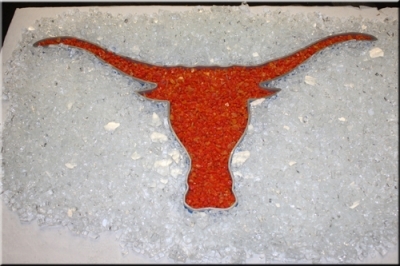 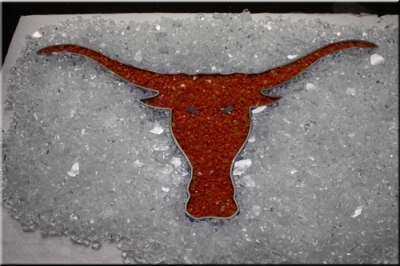 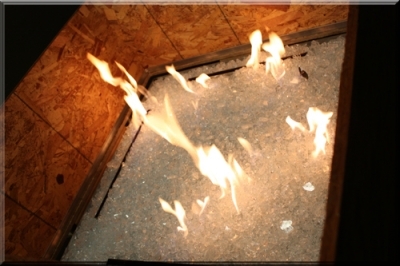 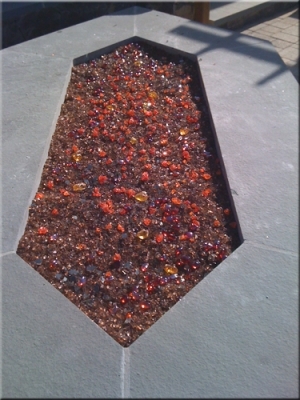 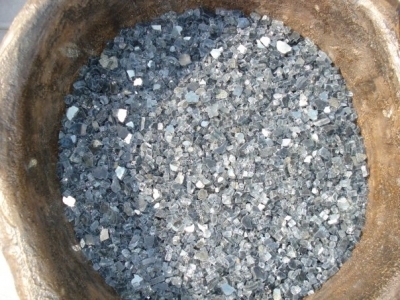 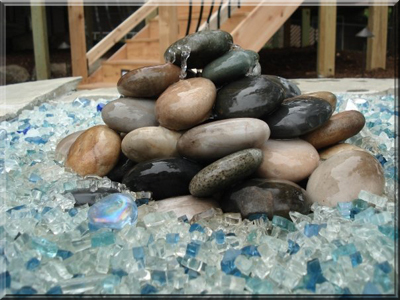 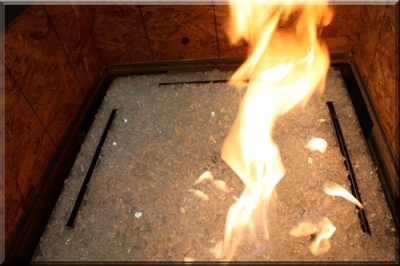 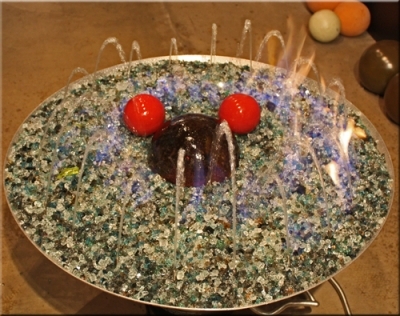 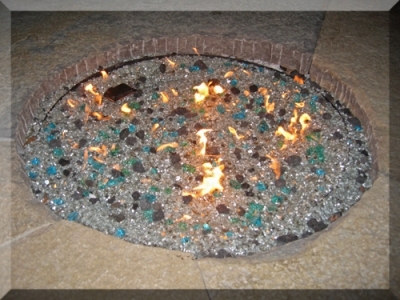 All of the fire glass was placed around the pile of fire rocks in the center. 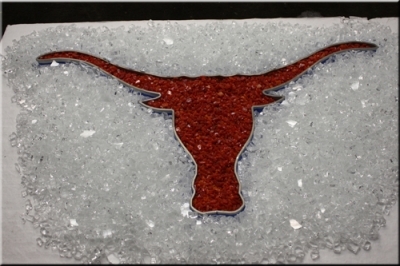 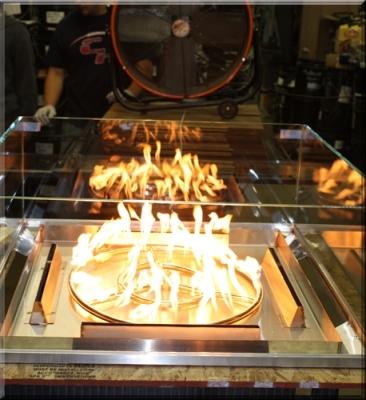 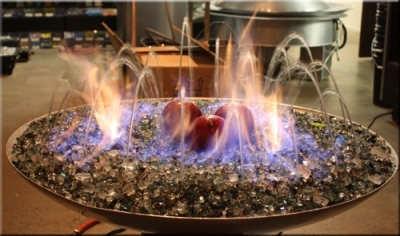 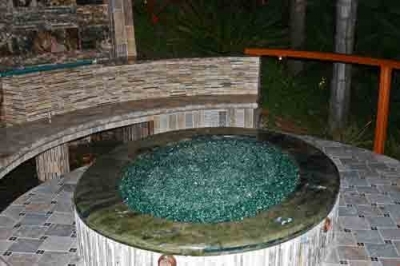 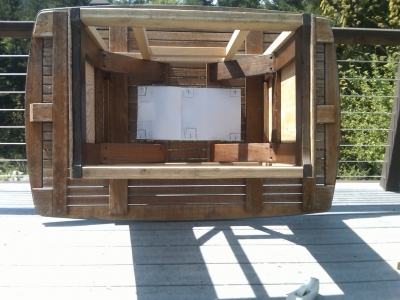 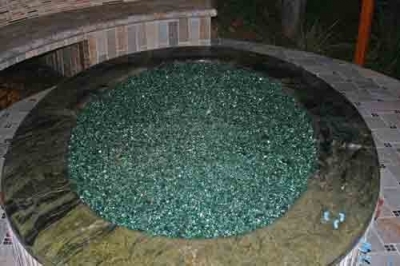 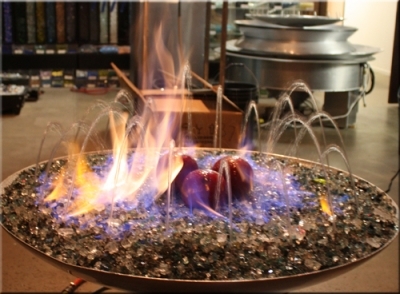 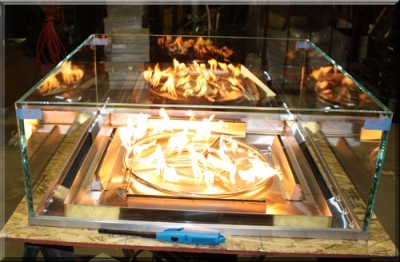 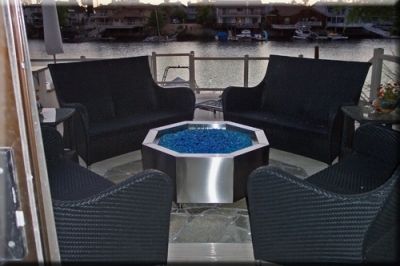 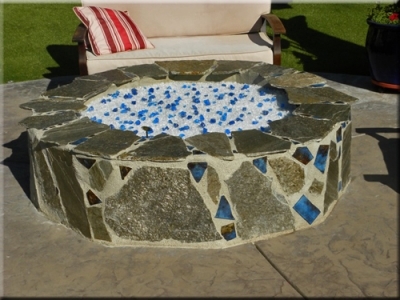 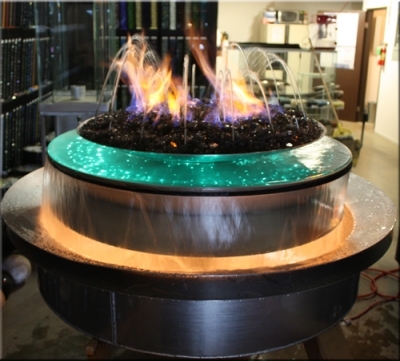 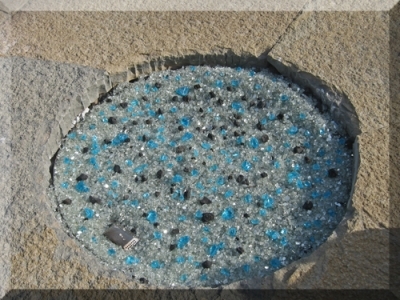 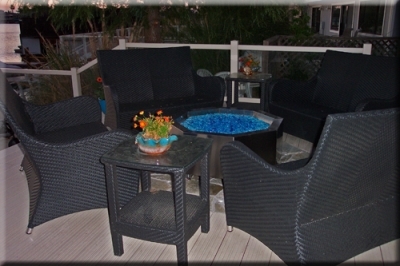 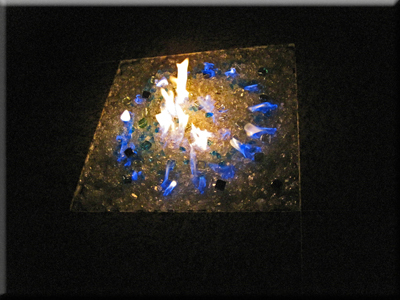 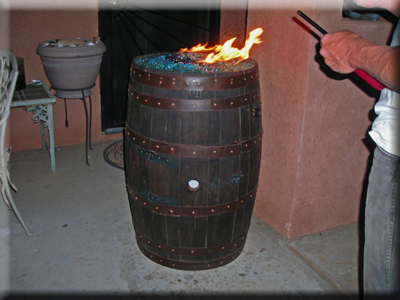 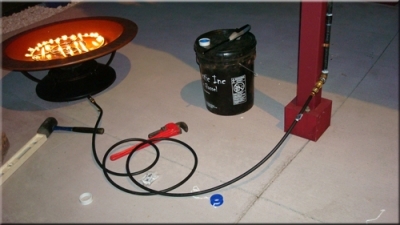 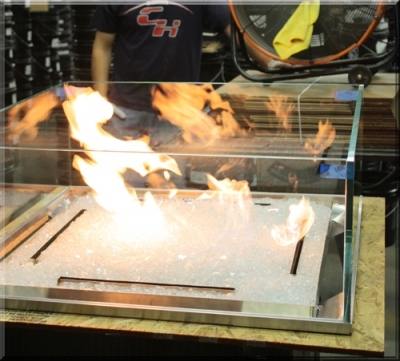 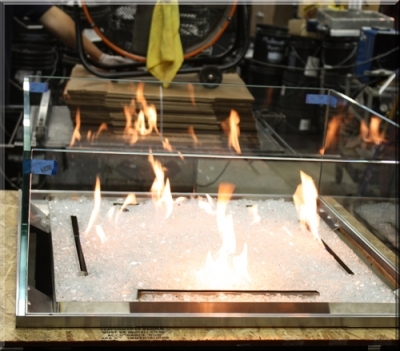 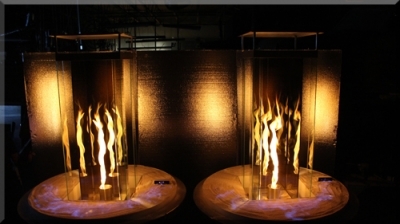 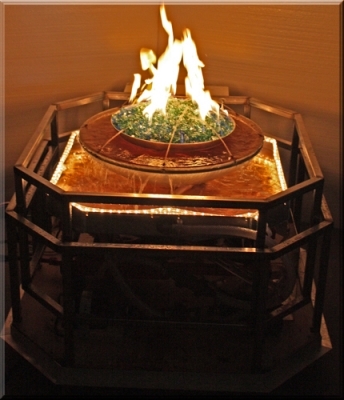 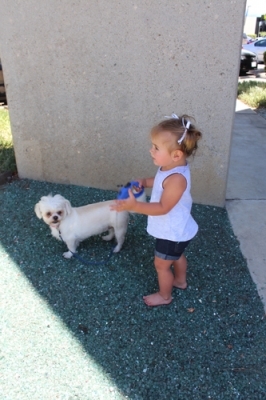 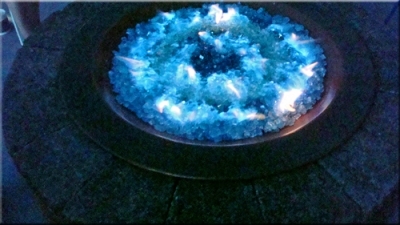 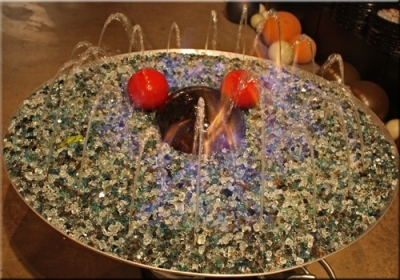 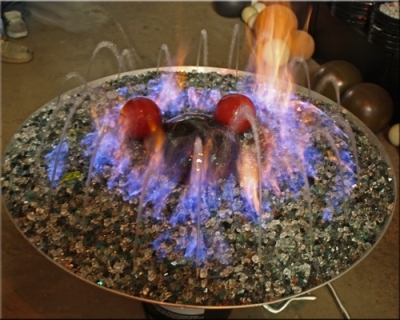 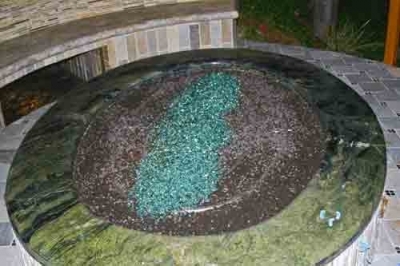 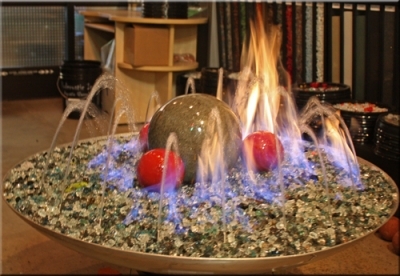 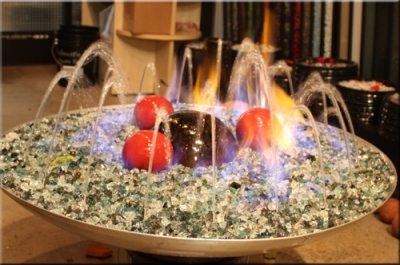 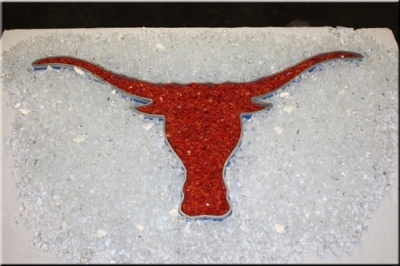 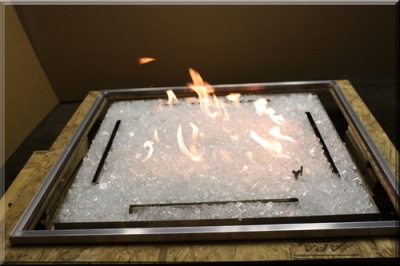 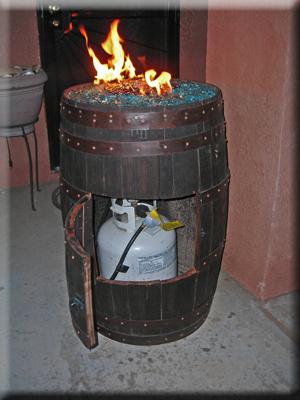 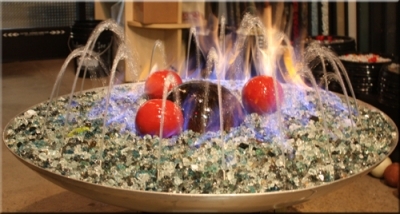 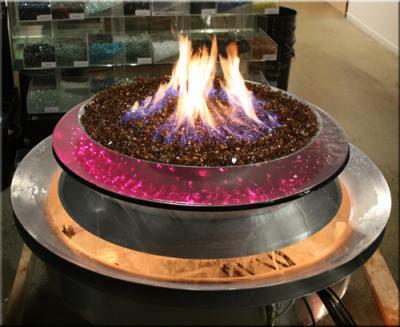 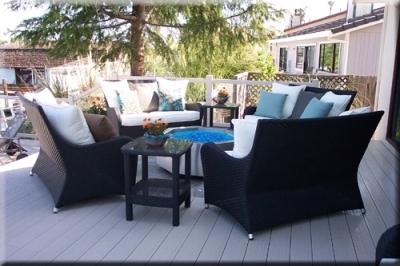 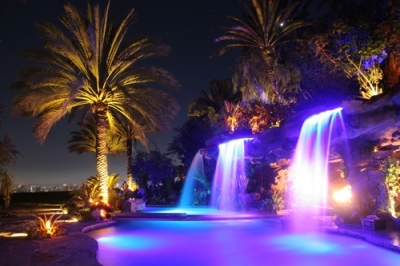 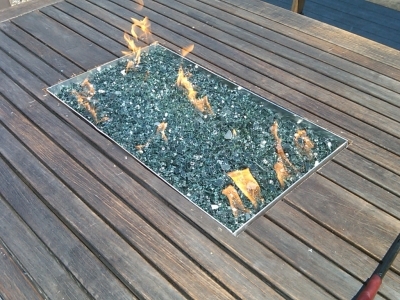 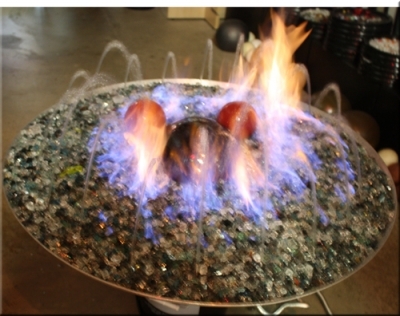 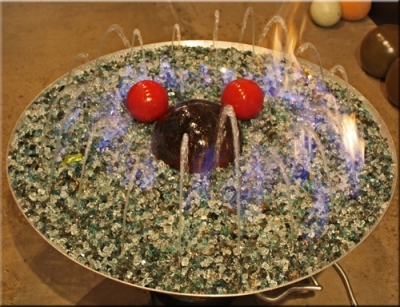 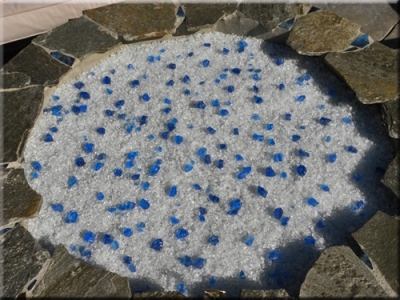 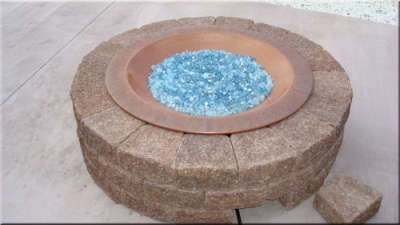 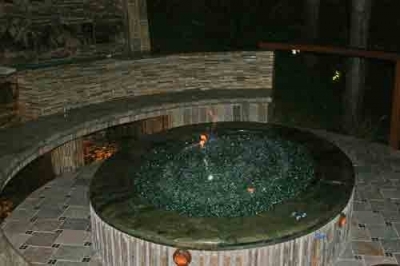 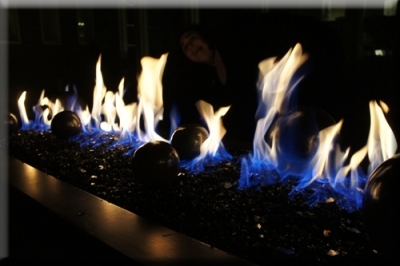 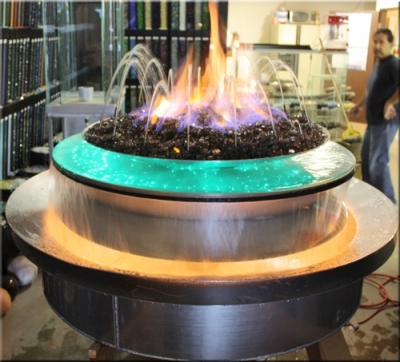 The FireGlass that was installed was: Starfire base, Blue Diamonds, and Ford Blue base glass. 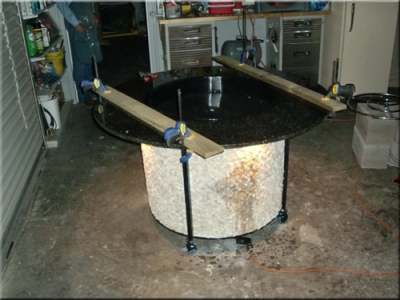 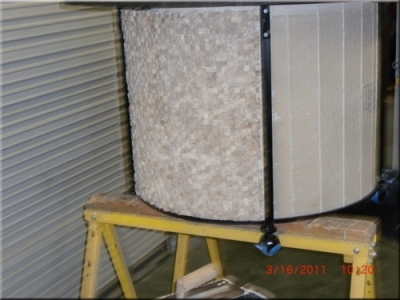 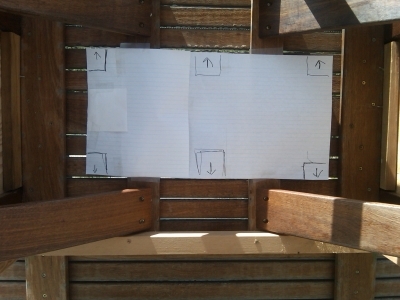 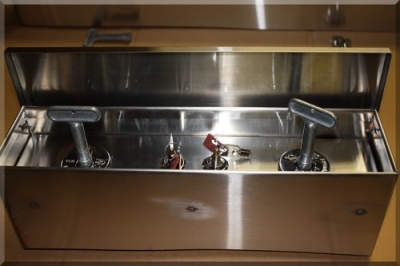 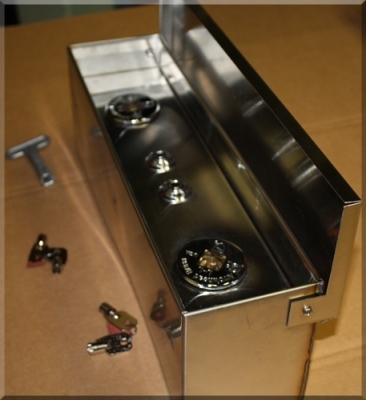 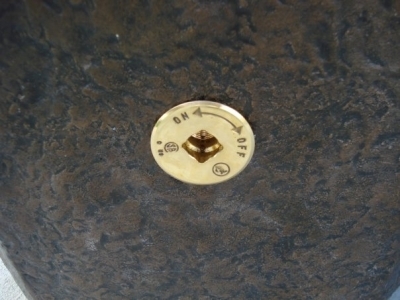 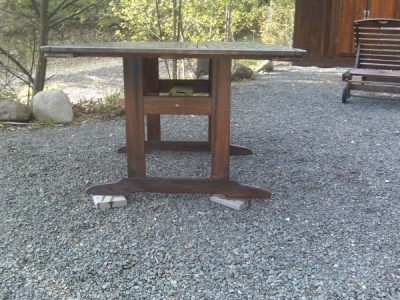 The top of the table is removable if you ever needed to service the water pump or any other reason. 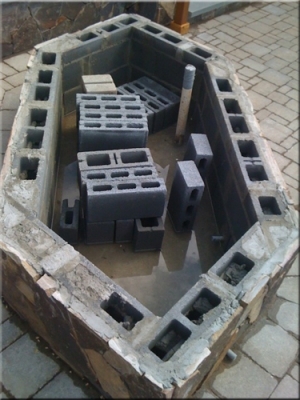 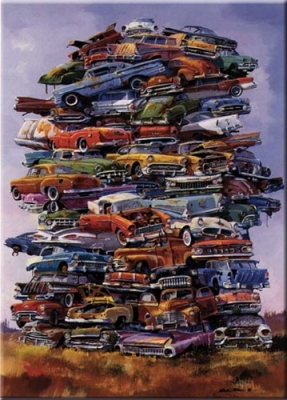 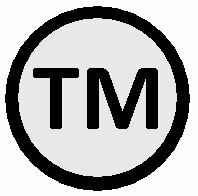 Always build and design it with replacement or repair in mind.